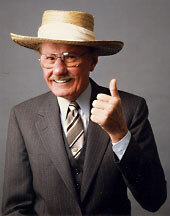 Bob Hoover has often been called the “pilot’s pilot”. He was a test pilot in World War II, then joining a Spitfire fighter group. He was shot down on his 59th mission and spent the remainder of the war as a POW in Germany. After the war Hoover teamed up with Chuck Yeager on the Bell X-1 program, for which Hoover was backup pilot. He saw action in Korea in the F-86 Sabre jet. He also flew test flights in the F-100 Super Sabre and other advanced fighters of the day. Mention the legendary name “Bob Hoover” around a group of pilots, and no one else will get a word in edgewise all evening. Hoover flew a lot of different aircraft, and flew them all masterfully. He is best-known for his years as a star performer in the civil air shows. I was fortunate to watch Hoover perform in his Aero Shrike Commander at the Reno Air Races, in about 1978. You can still find videos on YouTube, and you should. I still remember seeing those sequences. I still get the goose-bumps. Hoover was not only the consummate pilot, he was a real gentleman. He was one of my heroes.